Please can I ask you reconsider your decision not to post anymore on the forum. I am a newbie to the Forum. 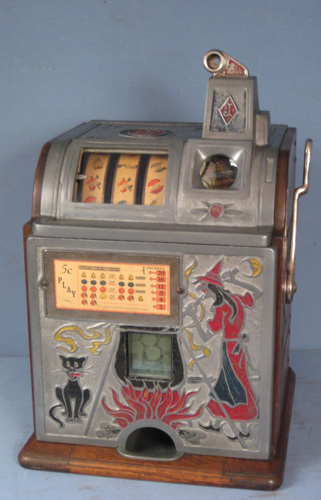 When I joined I did not own a slot machine. My goal was to purchase a Rol A Top but I knew nothing about the specifications or what to look out for. I went through the Forum archive on Rol A Top's. I found outstanding information from you and Stephane who I consider you to both be experts on Watling's. Of course there was also helpful information from other forum members. I learnt so much. I wanted to purchase a complete Rol with all the bells & whistles (European). I am happy to say that I purchased what I consider to be a beautiful example. It did need a few extra bits and with the knowledge that I learnt on the Forum I was confident enough to purchase the bits to make it complete. I am down to needing just an original Watling back door lock and key and an original Watling tool (handle) for cycling the mechanism when it is out of the cabinet. And once I have found these last items I have a complete Rol. I could not have achieved this without reading your posts. So please do not give up on posting. Your great knowledge on Watling Rol's needs to be shared with others and I am sure that I am not the only one that thinks so! The comments from two of the top professionals in their fields ( WatlingBoy and Swarmi ) is of great interest to me, as I feel the very same about the comments from various members on this Forum. These very few, like Swarmi and Watlingboy says , sometimes just want to see their names amongst the various responses to several subjects that these responders have no clue about and are obviously interjecting only what they have read somewhere else. 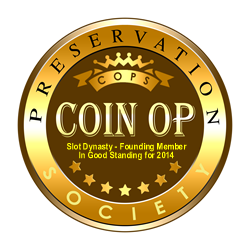 I am not an expert on any of these subjects, but I answer various questions from my experience as a businessman in the coin operated machine industry for more than 60 years, I was also fortunate to be a collector in this great hobby during those years. If for instance I wanted to know about the Frank Polk figures of which I owned several during my years of collecting, I would not essitate to contact Chris (Swarmi) in fact Chris as a picture of me with Ron Brooks and a Polk Miner that I bought in 1980, this picture was taken at the that time, or John Herman another knowledgable person on the subject, who have spent many years of research on the subject of the Frank Polk figures, I was lucky enough to meet both John Herman and also Ron Brooks who himself was a very knowledgable person on the subject, when I first got interested in the Frank Polk characters more than 35 years ago. Regarding Watling, my only Knowledge on this subject was when I researched the company for an article I wrote to celebrate the 50th, anniversary of the Bell-Fruit Manufacturing Company Ltd who had purchased the Watling tooling in the late 1950's, during that research I did talk to people who were actually involved in that purchase. When I comment on this Forum about any of the various questions put forward, I do it either through my experience as an actual operator and restorer in the early 1960's, or from actual reports and articles reported in the various trade magazines at that time. Another member of this Forum is Bill Whelan (SlotDynasty) who is with out a doubt the most Knowledgable person on Trade Simulators on the planet. I know for a fact that he was there in the thick of it during the early days of collecting, and wrote many an article on the subject and got his information also first hand. I get annoyed when some collectors on this forum make such a big thing about a spring on a coin rejector, or the 2nd coin rocker arm on a Mills escalator, during my days of operating or restoring, I removed these items and threw them away, because they caused a problem for an operator in the field. Things like these small items are not that important, it is the same when a collector wants to use these antique machines, they should be restored, but not to be played, when I collected antique machines, I would not allow them to be touched, how many people collect rare objects and constantly handle them, not very many, so you newbies and know-it-alls should leave the answering of questions to the above people who know what they are talking about, one recent question was about wha Bally models was in the Mapes Hotel in Reno in the early 1960's, one Forum member suggested they could be E1000-E2000 models, but could not see the LED on the machine, he would have been better not even commenting as the E models never came out until the 1990's. I am sure that there will be some snyde comments about my remarks, but who am I , I have only been in the business for 60 odd years on a daily basis, and still manufacture amusement games. Swarmi, Watlingboy, Slotdynasty, Steppane, Dave I salute you all, the rest of you, look and listen, you might learn the true facts about some of the great collectable machines of times gone by. vast KNOWLEDGE that they were always willing to share. Man ! This place is getting to be a real bummer ! You see this is the problem, this idiot is now complaining about this site being "A Bummer", I would strongly suggest people like him should be banned from the site, he is a typical person who only wants Freebies. he certainly is not a real coin machine collector, if nobody is going to be appreciative of the knowledge that is offered on this site, then I do not blame people like watlingboy from withdrawing from responding to the various questions about Watling machines, I suggest that the elder members of this site should not respond to any questions for one month, Slot Dynasty do you hear me, let these unappreciative so called collectors find out the hard way, let them make their mistakes and get stuck with a bunch of junk, we should just respond to genuine members through private messaging. "so you newbies and know-it-alls should leave the answering of questions to the above people who know what they are talking about, one recent question was about wha Bally models was in the Mapes Hotel in Reno in the early 1960's, one Forum member suggested they could be E1000-E2000 models, but could not see the LED on the machine, he would have been better not even commenting"
The above referred to my comment over a picture a forum member posted, asking "Wondering if anyone knows the make and model of this machine? Sorry for the poor pic. Mapes Hotel & Casino".....nowhere did he mention "in the early 1960's" - you added that in your slam - as all I did was note the make was Bally and I wasn't sure about, "Definitely Bally, looks like", the model as it resembled an E series machine, which I pointed out in response to the original posted question. Your opinion that it would have been better not even commenting, not needed here, and is insulting to even us "newbies". I'm sure many of the members here appreciate your vast knowledge of the industry, but there really is no need to rip a new a$$h0le into the less-than-seasoned collectors out there. It serves no real purpose here. Thanks to everyone who provided information about Baldecchi. I had heard of this name in the past but never really new anything about the company. Kind of sad that they melted down original Jennings castings to make them but back in the day I assume the old Jennings castings on the machines that were being taken out of service were not of any use so they might as well re-use the aluminum. Could everyone please lighten up a little bit??? If someone posts a message that has some incorrect information and you know what the correct information is I am sure the original poster and everyone else would appreciate a post with the correct information. That way everyone can learn. However, when correcting some inaccurate information please be civil. Remember, this is a community of people who all share the same interests. I want this forum to be an area where people can ask any question or express their opinion freely. I apologize for taking so long to respond to this thread. I was in a big poker tournament last week (did not cash ) and then had company all week. A person learns more by listening (reading) than they do by talking (writing), hence my few posts. I AM LEARNING: This forum is following the same path as the very trade stimulators that we collect: A good idea (trade stimulators/forum) appeals to a market (operators/collectors) that attracts users to a point where a few mob bullies force out the well intentioned businesses (forum resources) and kill the industry/forum that gave us a sanctuary of reliable information and insight without the threat of killing the well intentioned opinions of its members, of varying years and knowledge. I have made some wonderful connections that have helped me build a nice original collection, directly and indirectly. Those members have a reputation that goes without saying, and without public criticism of the very members seeking their knowledge. 1 - Well put Dave, and looking forward to your new Feature. 2 - Yes Freddy, I hear you, and will return your call soon. Family stuff going on. 3 - And to Mr. Mechanic, I will also return your call soon, as well. a quick last minute deadline to meet, was his last yellow cover, hard bound, full color, "Trade Stimulators and Counter Games". it was too late, and said they would be added to a later revised addition. His unfortunate passing has put an end to that story. cast iron machines, and all Trade Stimulators. Stan Wilker, (Watling), and several others that covered many areas of coin-op. 'Gobble-de-Goup'. If you think that's fun, just keep it up! well, or thoroughly, as to what he is throwing your way. Rest assured, he is not 'Blowing Smoke'. He knows the game. So LISTEN. !